Free radicals (sometimes called just radicals) are essential to life as they are involved in the conversion of air and food into chemical energy, and they help attack foreign substances in the blood system. This process takes place in the mitochondria of every cell, is a basic to metabolism. However, if too many free radicals are created they can cause harm by altering other atoms in a molecule, thus changing that molecule’s ability to function. Molecules are made up of atoms, and ideally those atoms are stable; i.e., they have their electrons arranged in pairs. You need a pair, because each election flies in the opposite direction from its mate, not in circles or orbits as shown in diagrams, but in wildly unpredictable patterns. An electron’s distance from the center of the atom (where heavier particles known as protons and neutrons exist) stays perfectly steady. In order for each electron to stay in the same orbit, it needs a mate spinning in the opposite direction, like two people each with an oar as the loss of one will seriously affect the other rower, and ultimately destabilize the boat. A free radical is an atom that is missing an electron. They are attracted to other molecules from which they pull away an electron, thus destabilizing it and creating another free radical, even as it repairs itself. This process can change the structure of a lipid causing it to get trapped in an artery and damage it, making it more prone to mutate and develop tumors. When too many free radicals are present and cause too much cellular damage–we say the body is under oxidative stress. Much research has suggested oxidative stress may cause, or at least exacerbate, all inflammatory diseases (like arthritis and lupus), Alzheimer’s disease, Parkinson’s, cancers, macular degeneration, cardiovascular disease, emphysema and ulcers. Many chemicals we ingest as nutrients can donate an electron to a free radical, thus acting as antioxidants. These include vitamins C, E and beta-carotene. They can replete free radicals, which then don’t need to steal from other body-based atoms. In the next section we’ll dwell on lipids as they are fat-based components of our body especially vulnerable to free radicals, as well ask making up cholesterol. Understanding lipids, and how they are affected by free radicals is important to making good decisions regarding your health. Oxidation is the combination of any substance with oxygen. A reducing agent donates electrons to another molecule. An oxidizing agent is known an “oxidant” and has the ability to oxidize other substance; i.e. cause them to lose electrons. The oxidant we call oxygen causes other substances to become water and carbon dioxide. In a fire it combusts with carbon-based material to create energy (heat) and CO2. In the human body energy (along with water and CO2) are created when metabolism splits the oxygen molecule into single atoms each with an unpaired electron. The ease and source of where another electron is found is largely determined by competition, and the older a body is, the more free radicals are seeking them. When there aren’t enough food-generated atoms with electrons to take, then elections are stolen from other body-based atoms, damaging the molecules made up of those atoms and impairing their ability to function. They also become unstable and continue the “chain reaction” of stealing more-and-more electrons until entire organs are damaged and more susceptible to inflammation, cancer and tumors. Peroxides are a group of compounds that have oxygen-to-oxygen (O-O) bonds; the “per” means O-O bond. The most common is hydrogen peroxide (H2O2) which is an oxidizing agent; e.g., it bleaches fabric by breaking down chemical bonds in organic molecules so they no longer can absorb visible light; i.e., don’t show stains. When a lipid is oxidized by an oxygen radical, it creates a lipid peroxide product which is similar to hydrogen peroxide–this is known as peroxidation. Lipids react with carbon-centered radicals, which pull a hydrogen atom away leaving peroxide and a radical carbon behind. The O-O bond in the peroxide is unstable, and steals electrons from other atoms causing a chain reactions leading to oxidative stress and damage to cells. Since lipids are essential ingredients in cells, like the walls of the 30,000 miles of arteries in your body, you can see how this oxidation can be damaging. Aging increases, dramatically, free radical production. Remember that in 1900 the average age of death in the US was 47 (37 years 2000 years ago)–we evolved over 4,000,000 years to get to age 47, and over the last 100+ years we’ve increased life span into the 80’s. Our bodies were designed to get through early adulthood, so our organs begin to expire in our 30s. There are no medical symptoms of oxidative stress; however, naturopaths believe headache, fatigue, noise sensitivity, memory loss, vision problems, gray hair and wrinkles, brain fog and joint pain are related to it. There are no tests of free radicals; however, indirect measures of oxidative stress involve measuring byproducts of lipid peroxidation, but there is no evidence that they are accurate or even valid. 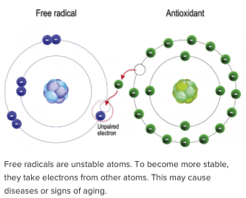 Antioxidants contain atoms that are able and willing to give up electrons to free radicals, without becoming destabilized themselves which would contribute to the problems. Our body produces them, but not enough especially to combat the numbers of free radicals produced by older people over decades. Thus, we need to get them from out diet and, as some claim, through supplements. Antioxidants include: the vitamins C and E, beta-carotene, lutein, resveratrol, etc. They are also plentiful in colorful vegetables and fruits like orators, broccoli, spinach, berries, green tea and nuts. The idea of using antioxidants grew in the 1990s to combat cancer and, of course, neurocogitive degeneration. The concept that they need to be balanced, or in correct proportion to one another, was supported by the original Age-Related Eyd Disease Study (AREDS) finding that zinc, beta-carotene and vitamins C and E in combination could offer some protection against age-related macular degeneration. This was further refined by adjusting the proportion of each in the mix, in the AREDS2 formulation, now recommended by eye specialists. However, research which will be described below, found heavy smokers taking a beta-carotene supplement to have an increased risk of cancer–which argues for getting your antioxidants through natural foods rather than supplements. Intense cardio exercise induces oxidative stress by making more free radicals through excessive metabolism; however, light regular exercise appears to reduce oxidative stress. Polyunsaturated fatty acids (such as those found in biological membranes) are particularly vulnerable to oxidative stress because of the multiple unsaturation points found along their backbone. In the next section we discuss what are lipids and their role in health.